Over the past couple of years, capital has flowed into blockchain startups and Initial Coin Offerings (ICOs) faster than bordeaux at a wine-tasting event; and despite recent knocks to cryptocurrency’s value and scares over its security and legality in recent months, the tech ecosystem’s appetite for cryptocurrency and its underlying blockchain technology remains strong. In Singapore, stakeholders in the ecosystem are warming up to the idea that blockchain is here to stay, but there remain many challenges. 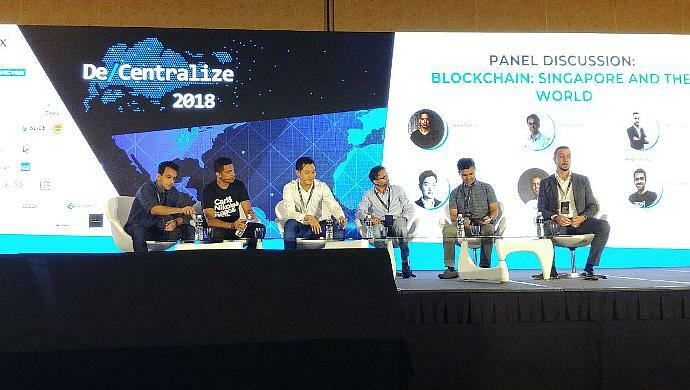 Today, at a panel discussion in the De/Centralize 2018 event moderated by Mohan Belani, Co-founder and CEO of e27, blockchain experts discussed the issues Singapore’s ecosystem still face and the steps that can be taken to overcome them. The general sentiment was that blockchain technology is still nascent and many people in the tech industry, as well as those outside of it, were still unclear about its use cases and reliability. The genesis of any industry begins with a community: a group of like-minded individuals with similar ambitions. For young startups, community support is vital. Kumar said that when his startup Zillliqa — a public blockchain platform designed to scale to thousands of transactions per second — was starting out in Singapore, his team was lean and everything was done in-house — from product development, crafting of the whitepaper, and marketing — so you can imagine how thinly-stretched his resources were. Getting connected to the community for extra support is therefore critical. Now, there exists a healthy slew of blockchain and cryptocurrency events. But one aspect that is still missing is a strong developer-focused community, the panel said. According to Bains, the blockchain community in Singapore can do more to “get people get excited to work on blockchain projects…people who can get their hands dirty”. In fact, the lack of blockchain developers in Singapore is so acute that blockchain investors actually outnumber them (though they did not provide any figure). This presents a problem. In Sukhani’s case, it made it difficult for him to find the right tech talent who understood blockchain; who has the right mindset to approach this field. Because of that, he has had to find talent from outside the country and region, in places like Europe and India. Even among blockchain developers, there is a certain distance and divide amongst them. According to Kumar, though there are a few blockchain projects being worked in the public universities such as the National University of Singapore (NUS), they remain isolated from the general blockchain and tech ecosystem. In the past, it was difficult to pitch blockchain projects to VCs, since their primary objectives are to analyse exit opportunities for their portfolio companies and make money for their investors. And there were, and still are, many unknowns — such as whether blockchain projects are truly scalable. But thanks to the proliferation of cryptocurrency and blockchain startups, they have become more receptive; some are already active in participating in the financing of such startups. Chng mentioned that there are also cryptocurrency funds such as Kenetic Capital which is helping startups to conduct ICOs. For Chng’s startup DigixGlobal, an Ethereum-based platform that tokenizes gold, and Bains’ startup Bluzelle, a decentralised database platform, they were able to clinch a partnership with Japanese VC Global Brain. It saw the rise of ICOs and were able to adapt their business model to leverage this new vertical. But a key question remains: how can VCs add more value to blockchain startups beyond financial support? Global Brain took a hybrid approach to DigixGlobal. Chng said the VC gave the company the freedom to create its own tokens. One of them is the DGX token (tokenised gold) — set to release this Sunday. Global Brain also helped connect DigixGlobal with supply chain solutions and form relationships with other enterprises. As a Japanese company, Global Brain also has connections to major Japanese MNCs such as Sony. For a deep tech company like Bluzelle, having a seasoned investor partner with strong connections helps add credibility to its brand. The important thing to note is that there needs to be greater awareness and education about blockchain. VCs can help evangelise blockchain (only if they are properly convinced, of course) to their wider business network, and in turn, pull in more backing for the blockchain support — from large corporates to SMEs. Blockchain solutions could possibly change how society is run, but the operative word here is “possibly”. At this stage, many groundbreaking blockchain solutions are still in their proof of concept phase. If these projects do not take off the ground and are not implemented in society, then the blockchain hype would have been just hot air without substance and fade into the annals of history. Bains explained that there are currently two types of blockchain applications that have been successfully executed: those that service the needs of the cryptocurrency market and those that support the infrastructure for cryptocurrency. The problem with this is that none of these applications have any ‘real world’ use. Soon, the time will come for these conceptual world real-world applications to prove that they are more than just a theoretical experiment. Putting money into Bitcoin, Ether or an ICO project is akin to gambling: one goes in with the expectation they will lose every dime they put up, after all, cryptocurrency is all speculative (although, of course, Ether has more use cases than that). Governments need to come in and regulate the ecosystem, the panel said, but not to the point it stifles the development of blockchain, such as an outright ban. At this stage, the Singapore government is still cautious about regulating cryptocurrency (it’s probably a good sign they are weighing their options carefully and not overreacting to cryptocurrency’s volatility). Chng said that he hopes the Singapore government will adopt a bottom-up approach and level the playing field for all blockchain companies, because right now, the community is pretty much self-contained and therefore self-regulating its members. The Singapore government also needs to ensure that blockchain companies that conduct their ICOs in the country actually contribute to the blockchain ecosystem and run their operations here, as opposed to setting up a shell company to take advantage of its favourable business environment, Bains said. The blockchain ecosystem is growing fast, and just like the wild west of early 90s internet, there are many uncertainties. But as long as every stakeholder in the industry can work together to iron out these issues, the blockchain community will only grow stronger. The post Singapore is warming up to blockchain but many challenges remain, say experts appeared first on e27.